State Department insists that PLO officials are in charge of 'unity' government - despite the fact that strings are being pulled by Hamas. Washington said Monday it will work with the Palestinian Arab unity government and maintain aid, while "watching closely" to ensure it respects the principle of non-violence, AFP reports. State Department spokeswoman Jen Psaki said Washington believes Palestinian Authority (PA) Chairman Mahmoud Abbas has "formed an interim technocratic government... that does not include members affiliated with Hamas." Abbas has insisted that a 'unity' government would be based on what he called"the four Palestinian principles": recognizing Israel, recognizing the terms of international agreements, and the explicit rejection of violence and terrorism. But Hamas continues to be adamant over its full control of a "unity" government, expressing over and over again that it would remain in control of both Gaza and the PA after elections and insisting that Hamas leader Ismail Haniyeh would rule the government. 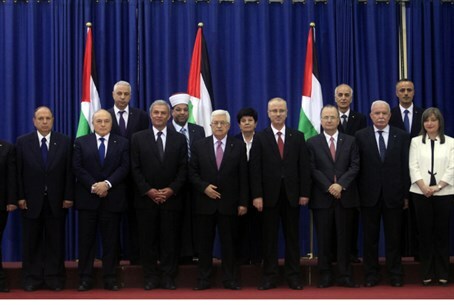 Earlier Monday, Hamas and Fatah swore in a "unity" government, headed by top-ranking PA officials but including several Hamas directives. Meanwhile, Hamas leader Ismail Haniyeh and several Gaza politicians left the government, vowing to step away from politics but maintain the fight for the "Palestinian nation." US aid to a "unity" government has been controversial, with concerns raised that the support sets a precedent for legitimizing Hamas. On Monday, Israeli Deputy Defense Minister Danny Danon also warned the US that its taxpayer money will ultimately fund terror. "The replacement of ministers in the Palestinian government is just a pretty wrapping for the terrorist attacks that were conducted and will be conducted under their protection," Danon stated. "Now, all aid given to the Palestinians by the United States and other countries directly aids terror attacks against the state of Israel." The US was initially hesitant to accept the new government, according to earlier reports. An official source in the PA reported last Friday that the US invited unity government Prime Minister Rami Hamdallah for an official visit to Washington DC, in a move the official claimed constituted recognition of the unity government. A senior American official denied the invitation later on Friday, saying the US has not yet formed a clear policy regarding the unity government, since that government has not yet been officially established. Psaki stated Sunday that US Secretary of State Kerry “expressed concern about Hamas’s role in any such government and the importance that the new government commit to the principles of nonviolence, recognition of the state of Israel and acceptance of previous agreements with it." Psaki reported that “President Abbas assured the secretary that the new government would be committed to these principles."